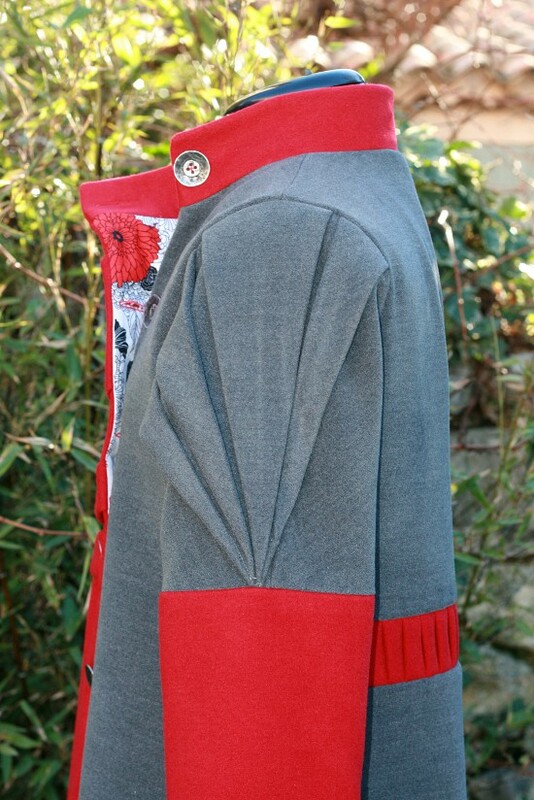 These fan pleats are located on the upper sleeves (4 pleats) and on the right front of the coat (3 pleats). 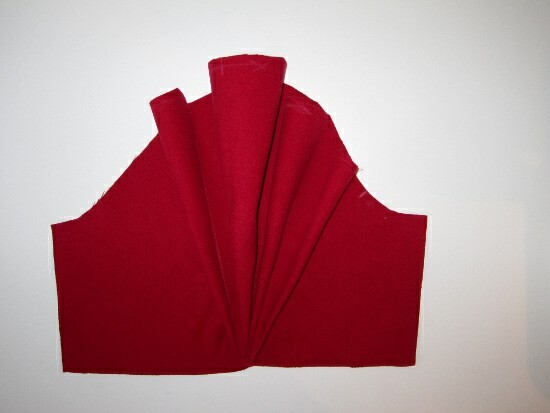 I made the tutorial using the upper sleeve pieces, the fan pleats are done exactly the same way for the right front. On the pics, the sleeve changes color from step to step (once red once gray), don’t worry about it, it’s just because my sleeves are different colors and I took the best photo for each step. The weather was overcast, no light, I hope that the pics will still be good enough. 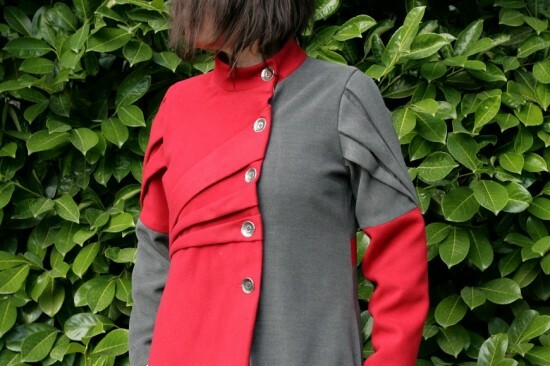 You’ll see, even if it seems complicated when you see the finished coat, it really is not ! And now, the tutorial ! 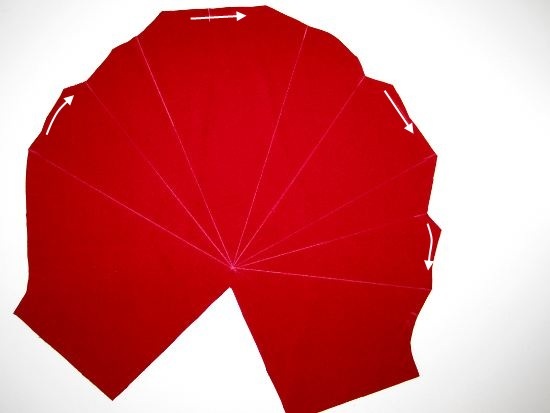 Draw the fold lines according to the pattern on the right side of the fabric, with chalk. 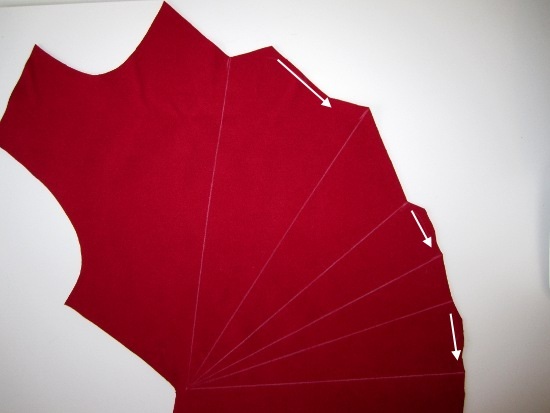 Also mark the small arrows in the seam allowance, which indicate how to fold. 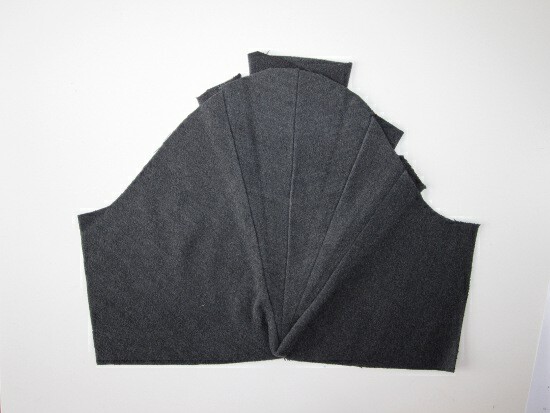 On the right side of the sleeve, fold and pin pleats, wrong sides together, matching fold lines that go together (see arrows). 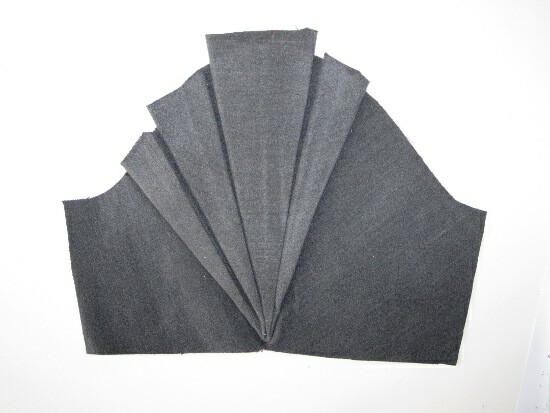 Right side of the sleeve – Match fold lines, according to the arrows. 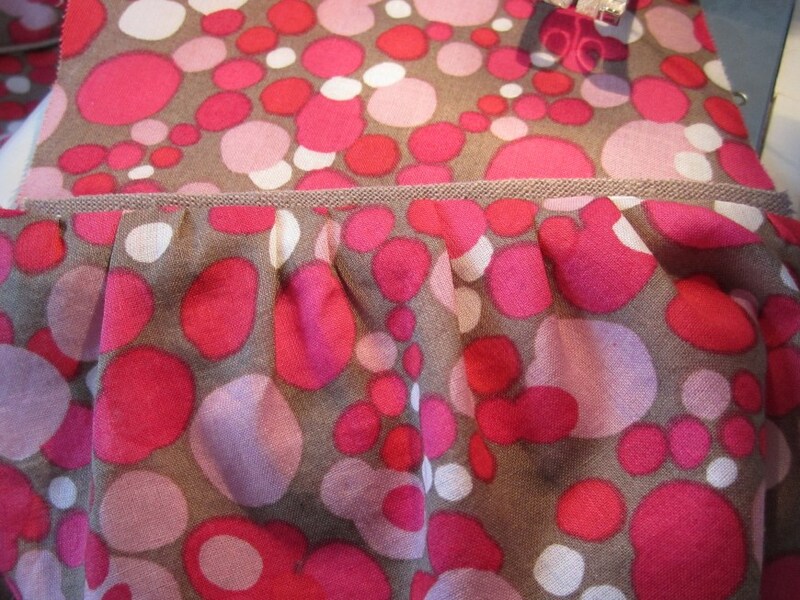 Right side of the sleeve – the pleat has wrong sides together. 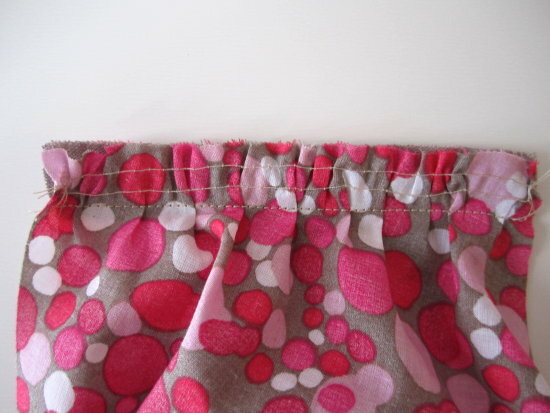 Choose a thread matching your fabric well as the seam is on the right side and could be seen at the tip of the folds. 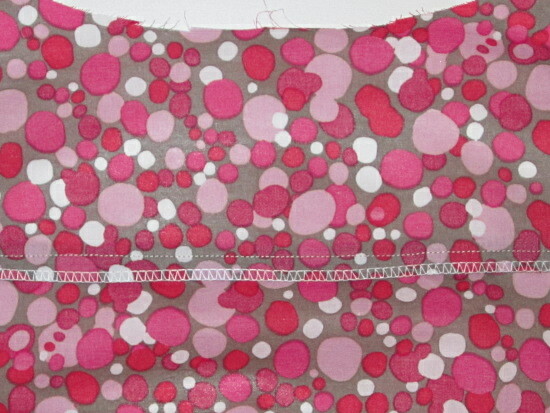 If your fabric is a print, select a thread color matching the background. 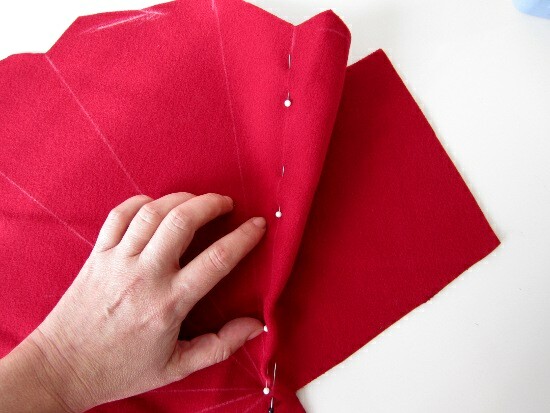 Stitch along the fold line, being careful not to catch another fold, especially at the tip. Stitch on the fold line – On the right side of the sleeve ! Do the same for the other pleats. 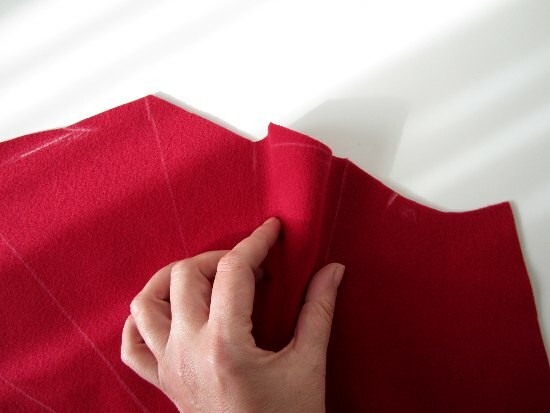 Shape the pleats so that they are equally distributed on both sides of their stitching line. 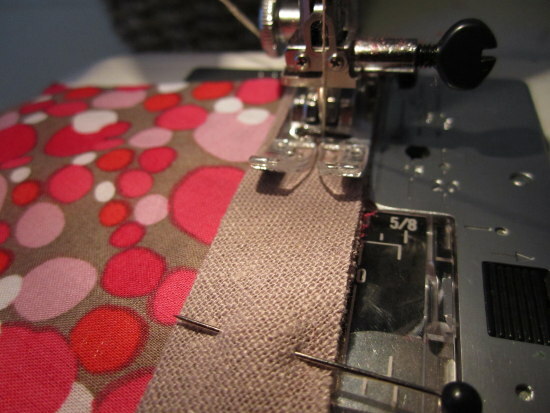 The pleat should be evenly distributed on both sides of the stitching line. Do a press test on a scrap before ironing the sleeve itself, if necessary, use a press cloth between your fabric and the iron to protect the the fabric. 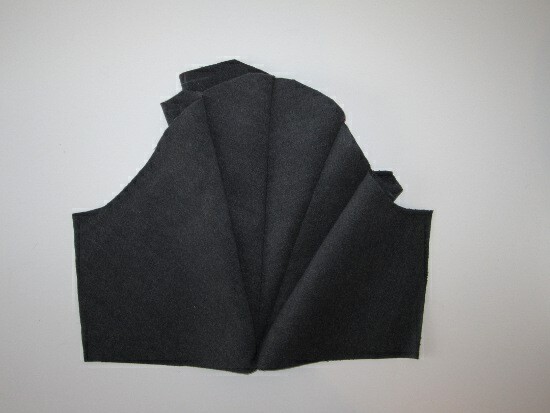 Right side – Pleats pressed and steamed. 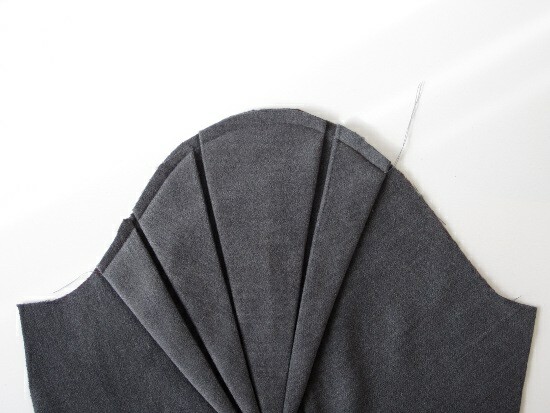 Wrong side – Pleats pressed and steamed. On the wrong side of the sleeve cut the excess fabric that goes beyond the curve. 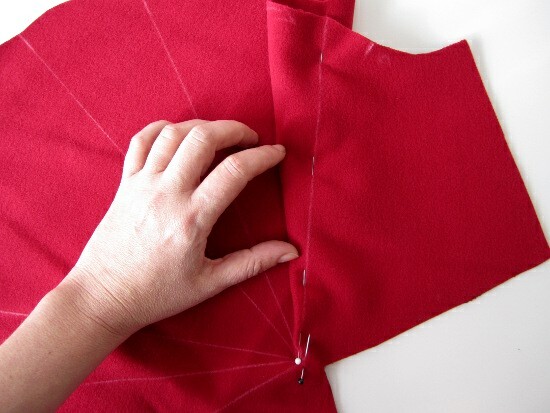 On the wrong side, cut the excess fabric that goes beyond the curve. On the right side, topstitch the pleats within the seam allowance so that they stay in place/shape during future handling of the pieces. topstitch the pleats within the seam allowance. And voilà ! Pleats done ! Sleeves fan pleats done ! 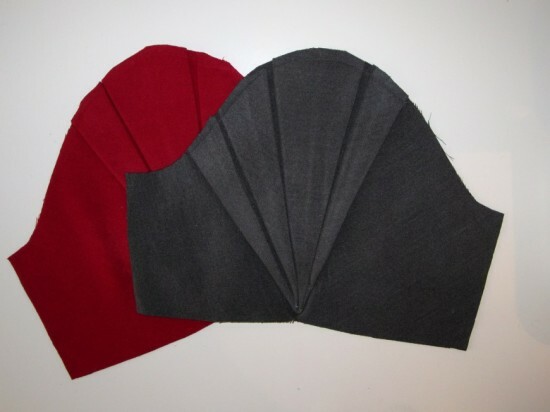 As mentioned above, proceed in exactly the same way for the 3 fan pleats on the right front ! 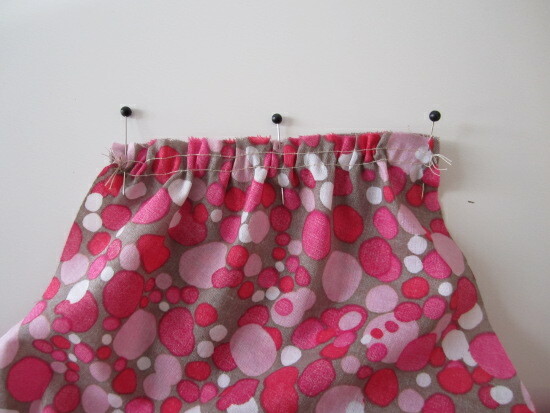 Here is a tutorial on how to sew flat piping. The tutorial was made using the Airelle blouse pattern by Deer & Doe, that’s why you’ll find, in the frames, specific instructions for this pattern. Adding flat piping is an easy way to embellish a garment, or do variations on a pattern, by accentuating a seam with a contrasting (or coordinating) fabric. Here is how to do it in 5 easy steps ! Length = length of edges to add piping to. Length = length of the edges to “flat pipe” – For my Airelle blouse that’s the front edges of the shoulder yoke + back edge of the shoulder yoke. Fold the bias strip in 2, widthwise and press. Fold in 2 and press. 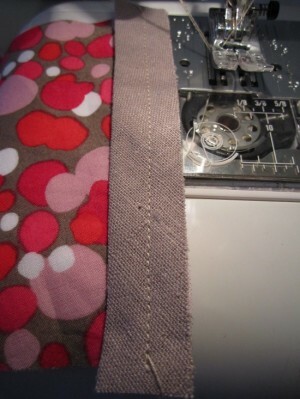 Lay the bias strip on the right side of the garment along the seams you want to add flat piping to, aligning raw edges. Pin. 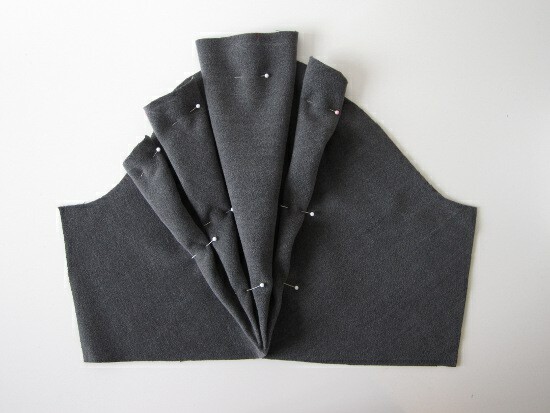 Pin the flat piping on the right side of the fabric, aligning raw edges. 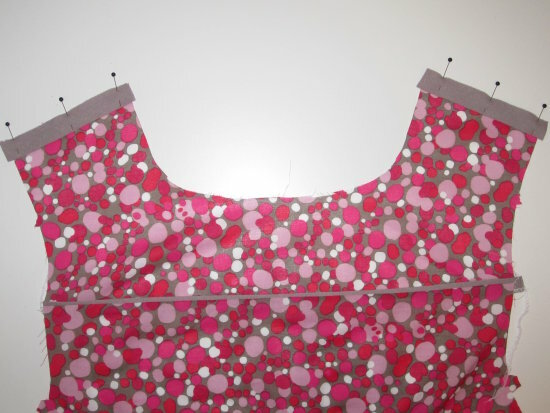 Flat piping pinned on the 2 front edges of the shoulder yoke. As you can see on the pic, I had already sewn the flat piping at the back and shoulder yoke seam. 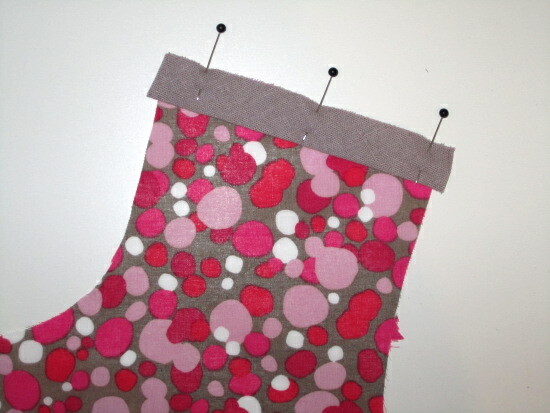 Stitch within the seam allowance to secure the flat piping. Stitch the piping on the right side of the fabric within the seam allowance. Lay, right sides together, the two pieces that need to be joined, the piping is sandwiched in between. Stitch using the seam allowance given in the pattern instructions. 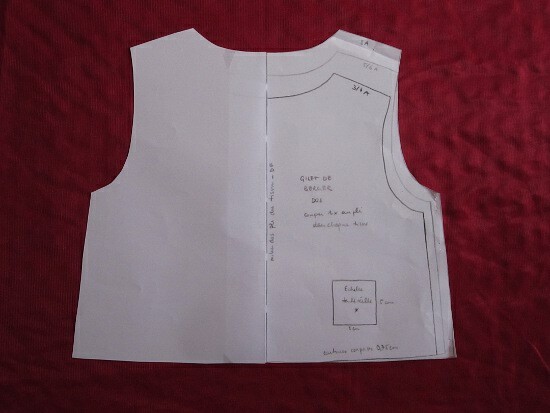 After gathering the top edges of the front, lay them on the shoulder yoke, right sides together, the piping being sandwiched in between, stitch according to the instructions with a seam allowance of 1.5 cm. 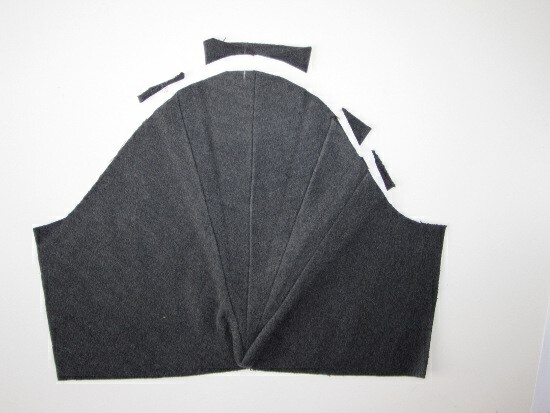 Flat piping sandwiched between the shoulder yoke, on which it was previously sewn, and the upper edge of the front (gathered). Overcast / serge the seam allowance. Press the seam allowance down. 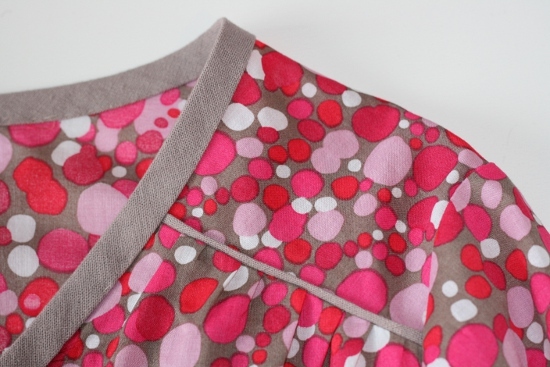 Seam allowance serged and pressed down – Here you can see the back + shoulder yoke seam on the Airelle blouse. And that’s it, flat piping added ! Easy peasy, right? I love this technique, it opens up new possibilities for easy pattern customization. How to sew faux fur ? 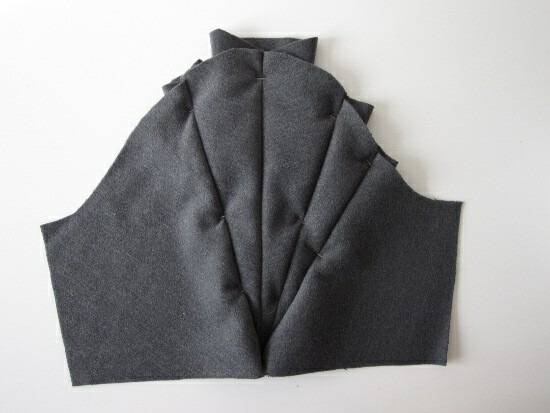 With winter coming, this is the perfect opportunity to sew vests, scarves, coats or small fur accessories. So here is a guide of things to know, do and not to do when you sew faux fur. I myself am sewing faux fur vests this week ! The steps are similar to sew real fur. But personally I chose to only use the fake kind. 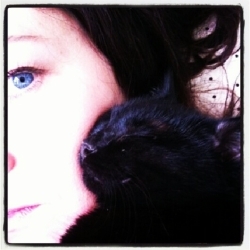 First, we must determine the nap/hair direction and mark it with an arrow on the wrong side of the fur. 1- fur should be spread flat in a single layer, wrong side (“skin” side) toward you, hair side toward the table. 2- The pattern pieces will all be laid out in the same direction: the direction of the hair. 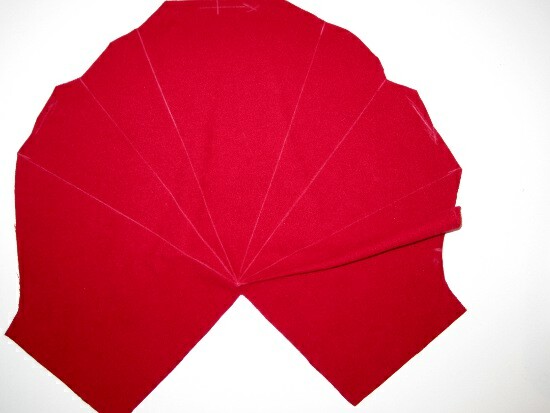 Pattern pieces drawn twice and taped to be cut on a single layer of fabric instead of “on the fold”. 4- For pieces that need to be cut twice (but not on the fold), it will also be easier to trace them twice in order to properly lay out, at the same time, all the pieces on the single layer of the fur. NB : When you need to cut two identical pieces on a single layer of fabric remember to lay out one as a mirror image of the other. Or you’ll end up with two left fronts instead of a left and a right. Draw the edges of the pattern pieces with chalk or marker on the back of the fur before cutting. Don’t forget to also trace the markings on the back of the fur. 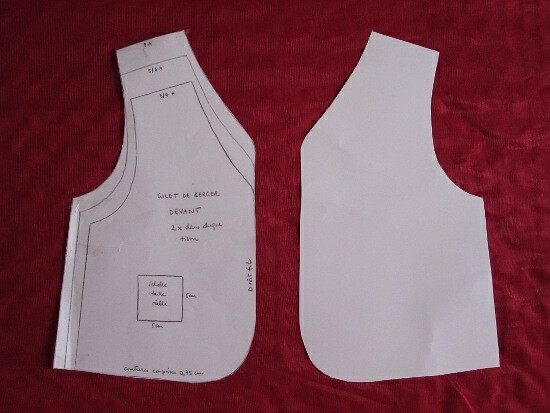 To keep the pattern pieces secured to the fur I personally, as I do for other fabrics, prefer to use pattern weights (any fairly heavy object can be used: small dumbbells, cast iron trivets,. ..). I only use pins if it seems essential. You should only cut the woven support fabric (in case of faux fur) or the skin (in the case of real fur), hair must remain intact. If you cut with scissors, like you do with any fabric, the hair will inevitably be cut too. This is even more important when the hairs are long. So at the cutting step proceed by cutting carefully along the tracings. 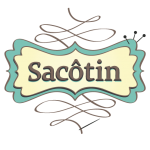 It is recommended to use an extracto knife or a razor blade to cut the woven fabric without cutting the hair, with small strokes and gently pulling away the edges as you do so. Watch out for your fingers and your table ! You can try to cut with the tip of the scissors, sliding along the canvas. This is longer and more tedious than using an extracto knife. Once you’re done cutting, take your pieces over the trash or sink, shake and remove the lint that may have accumulated along the cut edges … You’ll still need to get the broom out, but there will be less to pick up. Which needle, foot, stitch, thread? 90-100 universal needle with a regular presser foot and polyester thread. I use a long straight stitch. But a zigzag stitch sometimes works better with long hair. Do not hesitate to test on your scraps ! 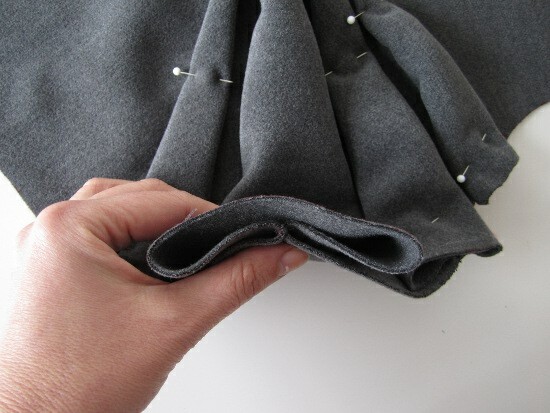 Lay the pieces right side together, pin perpendicularly to the seam allowance, pushing the hair inwards and not toward the seam allowance as you sew. Not with your fingers ! Use a small wooden stick or a knitting needle, for example. 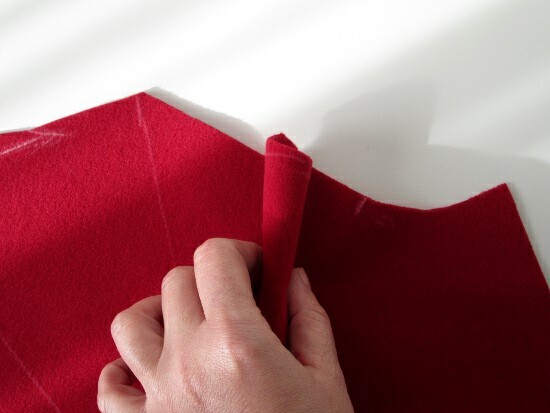 Before taking the fur to the sewing machine, you can also baste the pieces together by hand especially if the fur is thick, it will facilitate the work : the pieces will not move while sewing. This is a step that I do not overlook when the edges to join are long. Sew in the direction of the nap (so usually downwards) to prevent the hair from moving around. 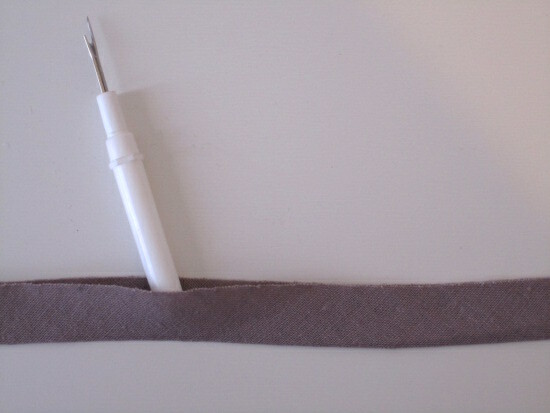 1- From the right side : gently pull out the hair caught in the stitches of the seam with a needle or a seam ripper. 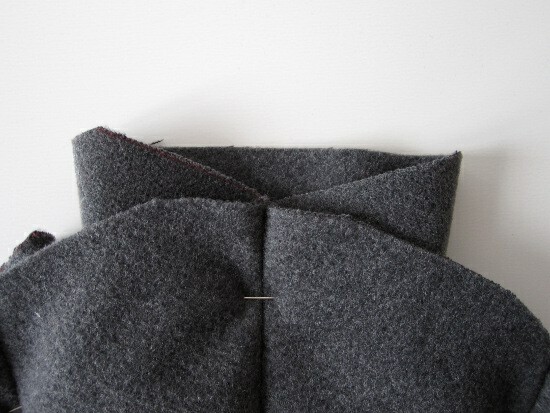 2- From the wrong side : cut/shave the hair of the seam allowance to avoid having too much bulk at the seam. Some shave the hair of the seam allowances before joining the pieces, personally I prefer to do it after. I might have to let out a seam a bit if the garment is too tight and in this case, “unhairy” patches would become visible. 3- Open the seam. As always pay attention to the temperature of your steaming iron so that it doesn’t melt the hair (if faux fur) and experiment on scrap before. Instead of using an iron to open the seam, you can also press with your fingers and a small wooden stick. 4 – For straight hairs (long or short) comb along the seam. For any other kind arrange the hairs with fingers. 5- Once the project is done : cleaning your sewing machine (bobbin compartment,…) is essential, lint, hair and particles will be trapped there. 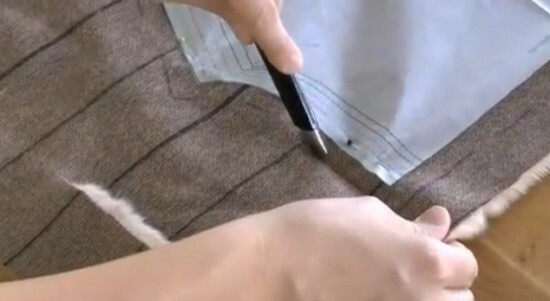 Here’s a video from Burda on sewing fur. It’s in German, which I do not understand a word of, but the images perfectly illustrate several points explained above. 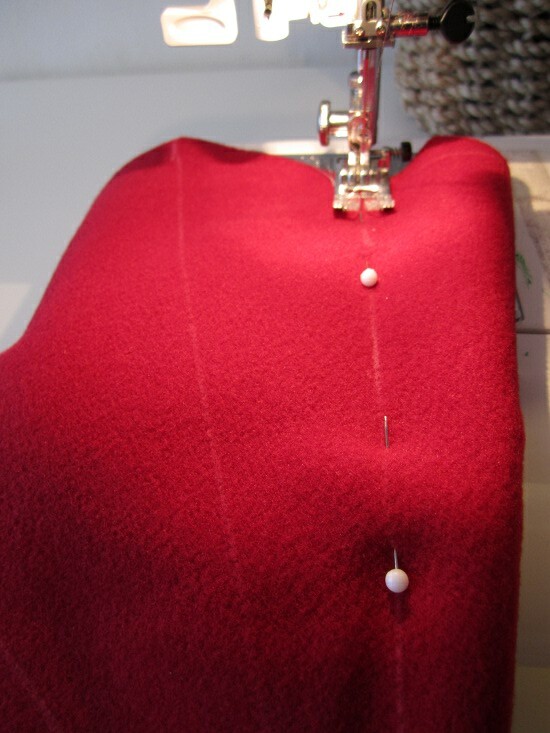 Sewing faux fur takes longer, requires more steps and precautions that other fabrics. But you’ll be rewarded with a cozy garment or accessory for winter.